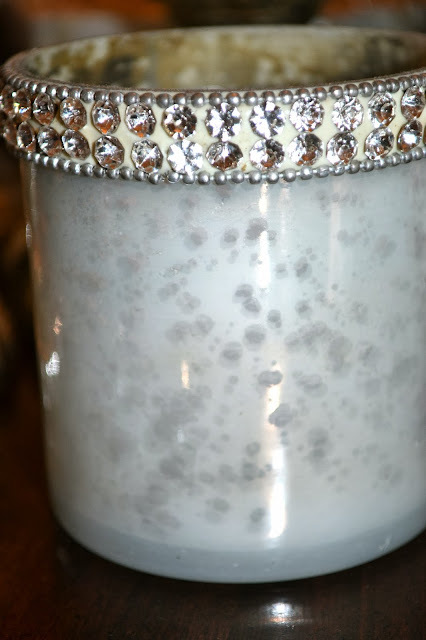 I love to use mercury glass and all that glitters. It shimmers and sparkles with candlelight. Glitter is my new favorite color! A touch of blue for a pop of color. A centerpiece using my glass ornament wreath. I filled it with silver baubles and starry string lights. A silver tray filled with champagne flutes for the ringing in the new year. And here’s to you, old friends and new alike. Saying goodbye to the old year and welcoming in 2014! Happy New Year! 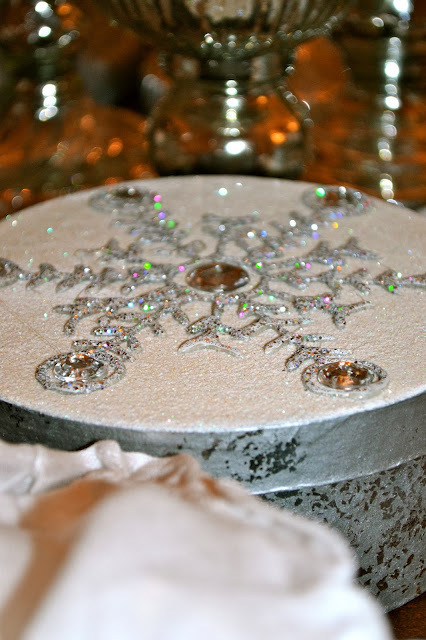 Such pretty and sparkly table setting! So beautiful. Happy New Year. Such a beautiful way to start the New Year! Thanks for sharing this, and may all your wishes come true! Gorgeous table! 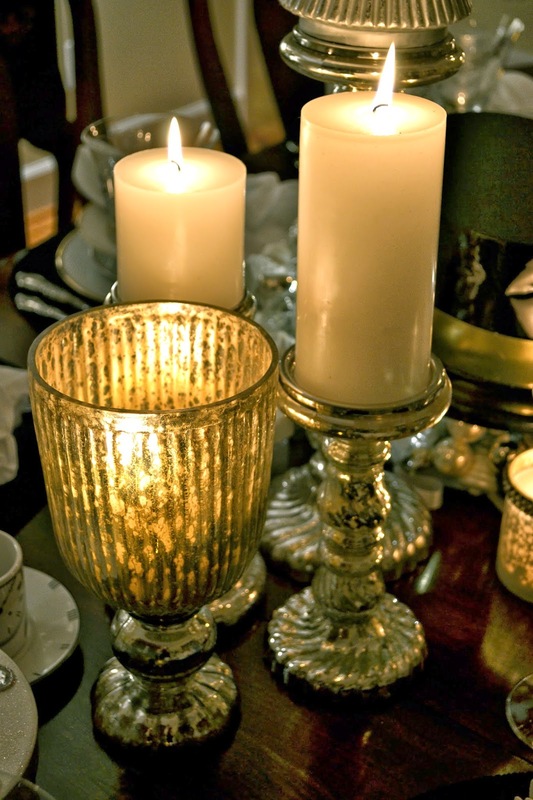 I love the mercury glass and ALL that glitters:) The gold rimmed plates are so pretty. Happy New Year and wishing you and your family all the best in the coming year! Your table is gorgeous! How I'd love to have a seat there! I especially like the fun time-cups. Perfect! Your tablescape is lovely and very elegant! I love your mercury glass collection. Gorgeous, Emily! 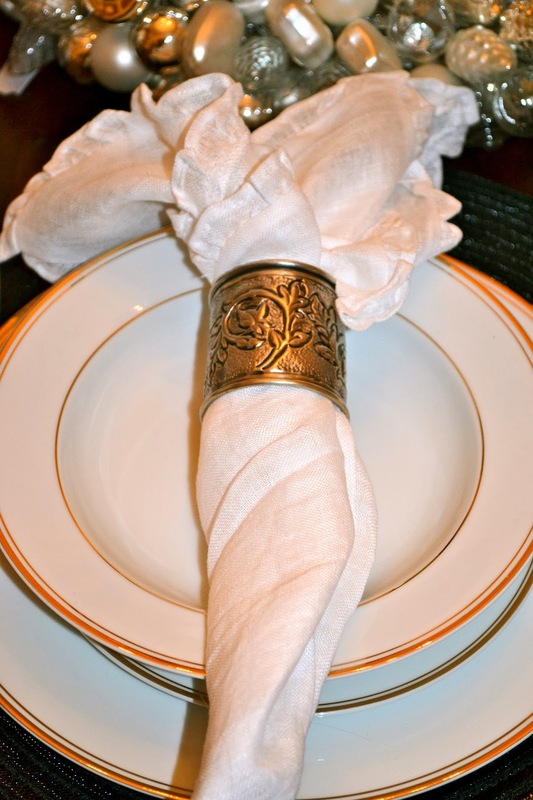 I really like the clock cups and roman numeral clock edges on the plates--perfect for New Year's. We had a music gig early last night, and then went to a friend's party to ring in the New Years! So Beautiful! 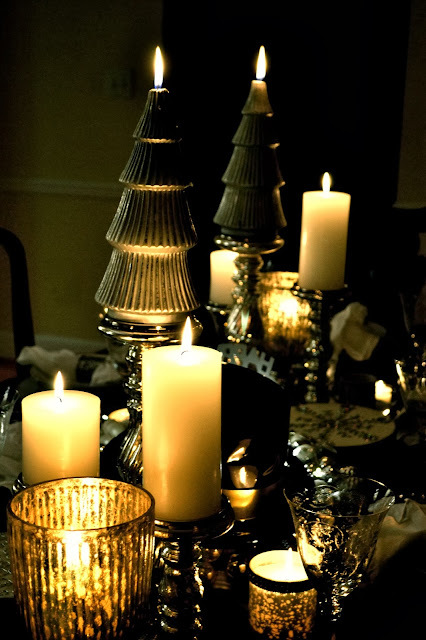 Your centerpiece is stunning and love the glow of the candles. It all looks serene yet festive - perfect for reflecting on the old and celebrating the new! Enjoyed seeing the Martin Luther quote too. Happy New Year! Just gorgeous! I too love the bling and sparkle, especially during holidays. 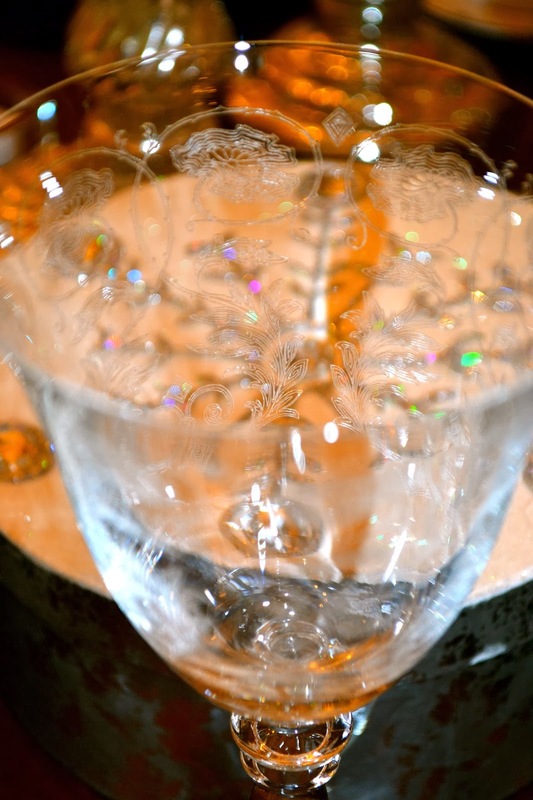 You have so many stunning pieces, your champagne flutes are so delicate and I love your clock mugs and plates. Happy New Year Emily! A beautiful table, I love it. It is elegant and refined, congratulations. Nice table setting. I hope you had a very happy new year. Wow! 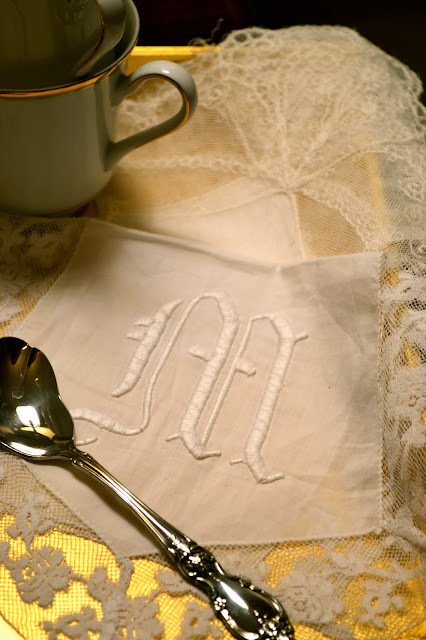 Amazing table...LOVE your centerpiece and all the sparkle and your monogrammed linen. Happy New Year! How pretty! 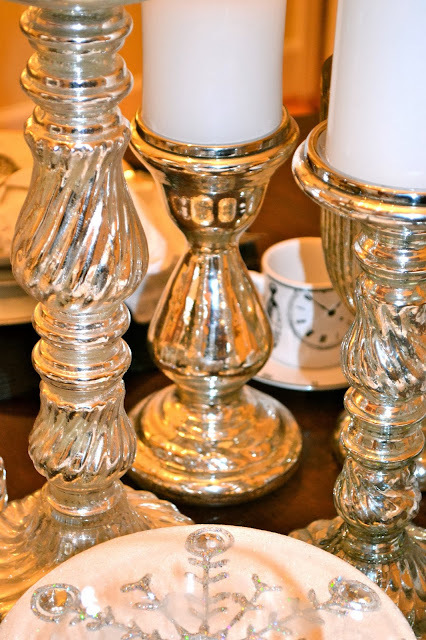 I love the silver, white, and gold…especially the mercury glass! I hope y'all have a healthy and happy 2014. Happy New Year! 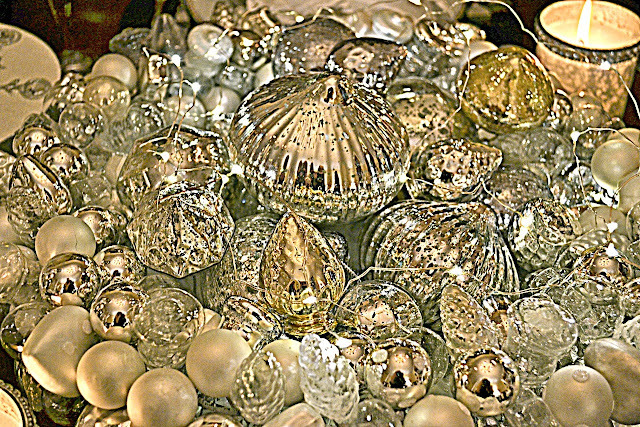 Your table is so pretty and I adore all of the shiny objects that you used. 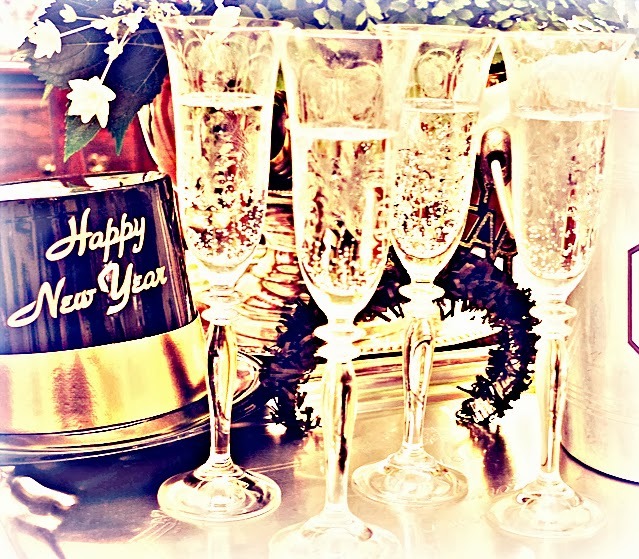 I love your gorgeous champagne flutes and the Happy New Year hat on the centerpiece. I hope that your 2014 is just as spectacular, as this table - Happy New Year!! Your table is beautiful, Emily! 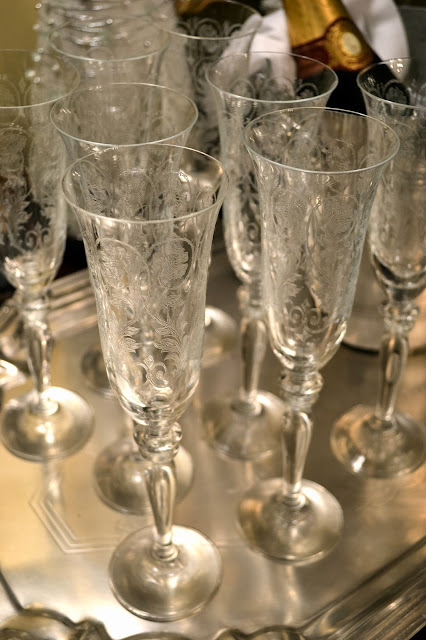 Love the pretty champagne flutes and the mercury glass. Thanks for joining the Open House party and I hope you have a wonderful 2014. Bwahahahahahahaha! I love that: Glitter is my new favorite color!!! I guess it's been one of my favorites for a long time, too, so I'm on board with ya, sister! That was a cool idea to use the wreath that was already laden with baubles and then fill it with even MORE baubles. Very pretty! Happy New Year to you and yours, dear Emily! Bonne et heureuse année ainsi qu'à tous ceux que tu aimes. Beautiful table...love all the glitter and sparkle. 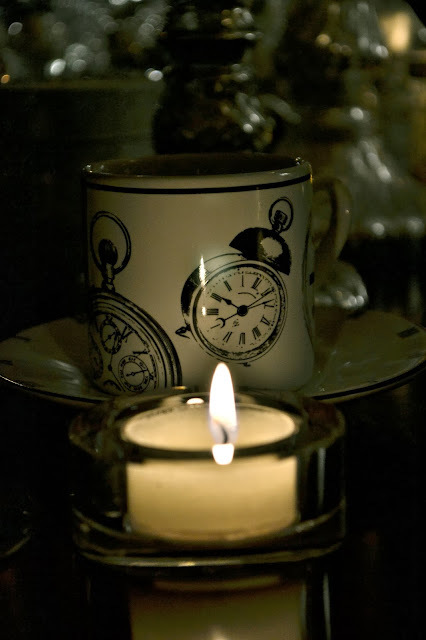 The clock cups are great! Oh, my word ! I love those champagne flutes! Happy New Year Emily! It's been a long time no see. 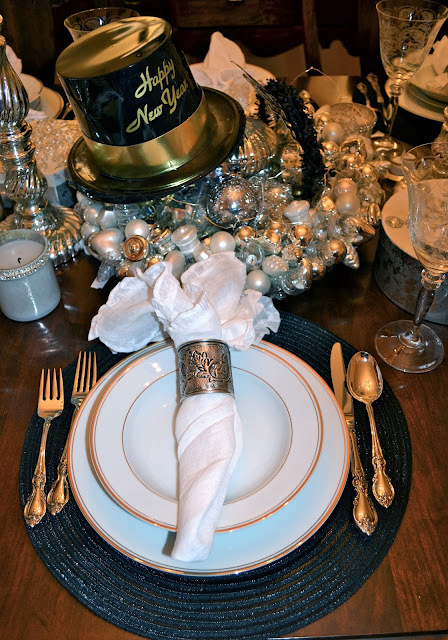 Your Tablescape for New Years is Gorgeous as always. I hope you and your family have a wonderful 2014 New Year. A very lovely Tablescape! I love all the sparkly elements and the flutes are gorgeous! I'm so glad to have a seat at your lovely table and look forward to all the others we share in this new year. Beautiful! Wishing you all the best in the New Year. beautiful table scapes - Happy New Year! Dreamy. I absolutely love every detail, Emily. 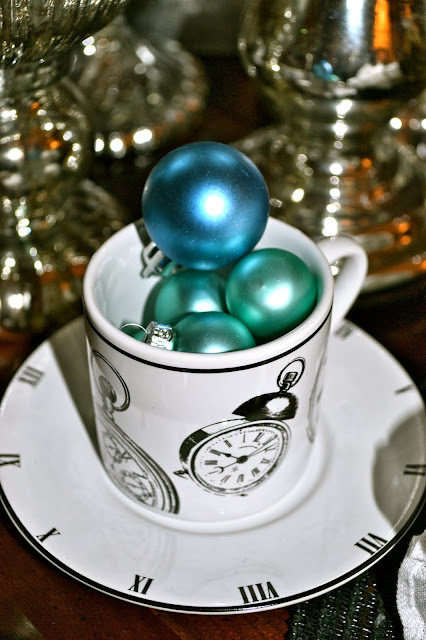 The centerpiece is gorgeous and the clock themed cup and saucer is PERFECT. Thank you for saving me a spot at your table. It's my honor. Your table is gorgeous! Would have loved to share a toast with you. May your new year be blessed.